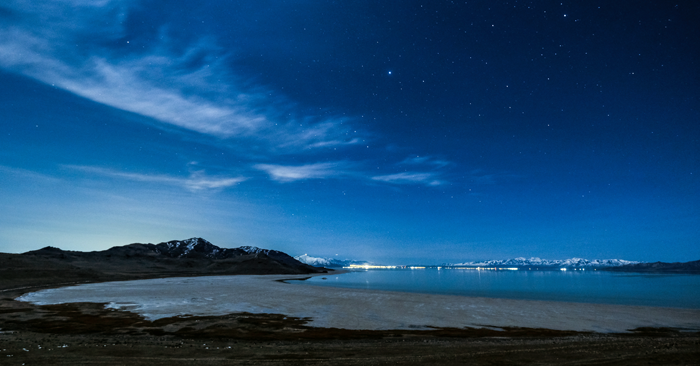 A nighttime scene in Antelope Island State Park in winter. Photo by Dan Ransom. I love visiting islands. I always feel a strong sense of crossing a threshold, entering into a different, more relaxed frame of mind, when I’m on a ferry leaving the mainland, setting off for an island destination. But as a poor swimmer who struggles to float, there’s also an element of fear — what if the boat sinks? Small islands particularly attract me; I like being able to see where they begin and end and their size allows me to get to know them intimately. Their separateness from (yet dependence on) the mainland fascinates me, and alongside seashores and forests, they are one of the natural environments humans consider most desirable. Vast numbers of tourists flock each year to destinations as diverse as the Canaries, the Caribbean, the Scottish Hebrides and Iceland in the anticipation of “getting away from it all” — although discovering upon arrival that many others have had the same idea. For some, a visit to an island can be a quest for isolation and self-discovery. Between the sixth and eighth centuries, a group of monks founded a community at Skellig Michael, an inaccessible, rocky island off the coast of Ireland. The monastery they built there was continuously occupied for around six centuries. More recently, a woman attempted to spend forty days alone on remote Shiant Island in the Outer Hebrides — although she had to be rescued after twelve days due to an injury. Whilst traveling to islands is generally easier nowadays, increased accessibility doesn’t seem to have lessened their strong gravitational pull on our collective imagination. I also love Dark Sky Places. Since 2010, I have been regularly visiting one particular Dark Sky Community which also happens to be an island — the Isle of Sark, in the Channel Islands between England and France. Getting there from where I live in Scotland takes time, as there’s no airport on Sark, but it always feels worth the effort the minute I get my first glimpse of its unpolluted night sky. Visiting a Dark Sky Place and island at once feels like getting two for the price of one. While going through their IDA application process, some Dark Sky Places have had issues setting the beginnings and ends of their core and buffer zones. On Sark things are more easily defined, as the whole island is the core zone and the buffer zone is the English Channel. 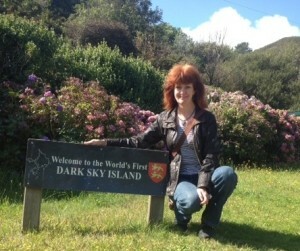 And whilst Sark prides itself on being the world’s first “dark sky island” there are now others: the Isle of Coll in the Inner Hebrides of Scotland, the Danish islands of Møn and Nyord, Antelope Island State Park in the Unites States, and Great Barrier Island (Aotea) in the outer Hauraki Gulf, New Zealand. All of these places join the growing number of mainland areas becoming recognized as Dark Sky Places worldwide (and in the process, becoming tourist destinations). Last September, I participated in the first European Dark Sky Places Conference at Gatehouse of Fleet, in South West Scotland, close to Galloway Forest Dark Sky Park. Not having a car, getting there involved taking buses, trains and taxis. As I journeyed to this place, somewhat off the beaten track, anticipation and excitement mounting, I was reminded of my trips to islands. And I speculated whether others might also find traveling to a Dark Sky Place held similar associations and allure to visiting an island. Whilst a journey in search of a starry night sky may not mean leaving the mainland behind and setting out to sea, moving through urban light polluted skies into a more rural, mysterious darkness involves crossing a different, but not entirely dissimilar, kind of threshold. Visiting islands and Dark Sky Places, we travel in anticipation of a special experience different from the everyday, perhaps seeking a place where we can be more at ease under the cloak of darkness, open to wonder and to discover things through a different lens, where the normal rules of what we experience with the senses don’t necessarily apply. It’s hard enough to gauge the “lay of the land” and orientate when light is limited, but on a very dark night when the horizon may not be visible, we may even experience what I did on Sark, a curious sense of floating — not in water, but between earth and sky. Nighttime aerial photography reveals vast swathes of heavily light-polluted countries and this is what often draws our eyes and our ire. Perhaps next time we see these images we might pause and refocus on the dark spaces amongst the glare. Some of these places may happen to be islands in the sea, but the majority will be on the mainland. No matter, all dark sky places are extraordinary islands of darkness amongst the glare, and all are worth the journey. Ada Blair is a psychotherapist and workshop facilitator living in Edinburgh, Scotland. She works both in the nonprofit sector and higher education, and has a private practice. She enjoys having her feet on the ground and her head in the clouds! Ada’s M.A. research about Sark was published through the Sophia Centre Press in 2016.